"Yugoslav leader during World War II. He fought Nazi occupation, made Yugoslavia independent fron the Soviet Union in 1948, and served as President until 1980." Josip Broz was born in Kumrovec, Austro-Hungary on May 7, 1892. He fought with the Austro-Hungarian army in World War I, and was captured by the Russians. He also served in the Red Army during the Russian civil war of 1918 - 1920. He later returned to Croatia and became a prominent union organizer. He was imprisoned as an agitator from 1929-1934. In 1937 the Party assigned him to reorganize the Yugoslav Communist party, and in 1941 he emerged as a leader of Yugoslav partisans resisting occupying Axis forces. It was then that he adopted the name Tito. Although many of his partisans were Communist, Tito's rapidly growing forces included many non-Communists. Although Yugoslavia's government in exile supported the Serbian resistance leader Mihajlovi, Tito's army and its successes soon eclipsed those of Mihajlovi and his chetniks. His successes were based on swift guerrilla tactics, his own magnetic personality, and the appeal of his political idea of a federated Yugoslavia to non-Serbian elements. After initial cooperation, Tito and Mihajlovi soon clashed. By 1943, Tito had a large army and controlled a much of Yugoslavia, centered in Bosnia. Tito had Soviet support from the first, and in 1944 he received full British and U.S. support. After he liberated Belgrade in late 1944, he negotiated the merger of the royal Yugoslav government and his own council of national liberation. In March, 1945, he became head of the new federal Yugoslav government. Already the virtual dictator of Yugoslavia, he won a major election victory in November, 1945, at the head of the Communist-dominated National Liberation Front. With the opposition abstaining, Tito won about 80% of the vote. King Peter II was deposed, and a republic was proclaimed. As premier and minister of defense from 1945, Marshal Tito ruled Yugoslavia as a dictator, suppressing internal opposition, executing Mihajlovi and jailing Archbishop Stepinac of Zagreb. He nationalized Yugoslav industry and undertook a planned economy. He didn't attempt to collectivize the small farmers, but forced them, under threat of severe penalties, to furnish large portions of their produce to the state. Although close to the USSR, Tito pursued independent policies and curbed the activities of Soviet agents. In 1948 the Cominform accused Tito of having strayed from the Party line. Tito denied the charges and refused to submit to the Cominform, from which Yugoslavia was then expelled. Having already transformed Yugoslavia into an armed camp, Tito built up a highly efficient secret police, and purged dissident elements in the Party, He maintained his position despite the hostility of the USSR and his neighbors. Despite accepting loans from the Western powers, he initially did not alter his internal program. In later years, however, he relaxed many of the regime's strict controls, particularly those affecting small farmers. As a result, Yugoslavia became the most liberal Communist country of Europe. On close terms with Nasser of Egypt and Nehru of India, Tito unsuccessfully tried to develop common policies among nonaligned nations. Relations with the USSR were alternately friendly and adversarial. 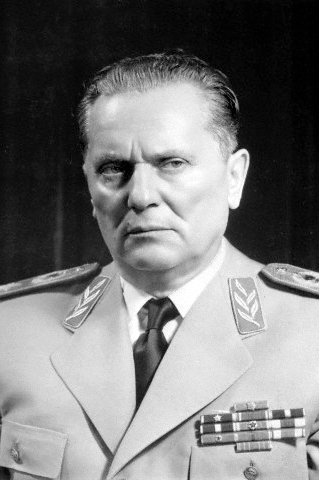 In 1968, along with Ceaucescu of Romania, Tito led the opposition to the Soviet intervention in Czechoslovakia. Tito was first elected President in 1953, and reelected numerous times thereafter. In 1963 his term was made unlimited. He provided for succession by establishing in 1971 a 22 member collective presidency, comprised of the sitting presidents of the 8 republican and provincial assemblies and fourteen others picked from those same assemblies. Their terms would be five years. Tito was elected chairman of the new presidency in 1971, serving until 1980, the year of his death.